Cassie, the Casco Bay sea serpent or humpback whale? It begins with a ripple on a glass-clear lake. A hint of a fin breaks the surface, followed by another. An errant flipper splashes. A big flipper. It’s about now that you’ve figured out that what is hiding within that lake is no ordinary fish. Face it, Maine does have record setting brook trout, but none of them would find a motorhome a tight fit. So now what do you do, save paddle fiercely to get off that lake? Do you tell someone? Will they think you mad? Sightings of lake monsters, as well as their no less intimidating cousins, the sea serpents, have been part of Maine’s history for centuries. No one has actually caught one, so the stories fall somewhere between fiction and fact. But some of those lakes are very deep and the oceans deeper still. Anything, as they say, is possible. We start at the tip of Maine with the tale of Ponik, first seen in 1873. Lake Pohenagamook is mostly on the Canadian side, but since lake monsters have no respect for border crossings the creature is part of Maine’s story. Some of the earlier tales passed down of the creature walking along the beach and spewing flames like your typical dragon, are most likely embellished. But Guy Leblanc, a mayor of the town of Pohenagamook, Quebec, saw the creature in 1990 while boating on the lake with friends. All on board saw the creature, most believing it to be a giant sturgeon. But over the centuries Ponik has been described as a having a horse-like head, flippers and a snake-like body that created humps in the water when it swam. In 1997 a local business offered $500,000 to anyone who could photograph Ponik. So far, no takers. 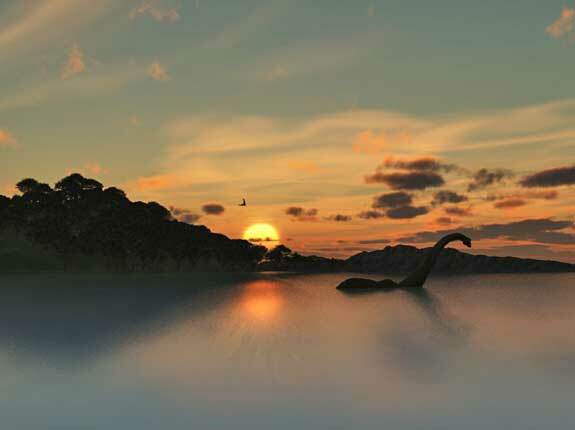 The Pocomoonshine Lake monster was first documented by Europeans in 1882, but the tale is an Algonquin legend. The Native American name for the lake is Nesiek, which translates to “muddy from the great fight.” An Algonquin shaman had a disagreement with a Micmac chieftain and they decided to settle the matter on the lake. Neptune became a giant snail and the Micmac changed into a 40-foot long serpent. The snail won, tying the dead serpent to a tree next to the lake. Since then there have been tales of a creature that not only swam in Pocomoonshine Lake, but that pulled itself out of the water and slithered over land to neighboring Crawford Lake. Sightings have only been in water, but the curved trails of the lake monster have been seen on land. In 1882 Sewell Quimby, who ran a nearby sawmill, confirmed seeing the trail, measuring between three and four feet wide and nearly three foot deep in some places. It was just like a snake track, only much bigger. Estimates, based on this and the water sightings, place the lake monster at between 30 and 60 feet in length. That probably seems like a stretch of the imagination, but consider this, the Anaconda, native of the Amazon jungle, can grow to 30 feet long. The difference between the Pocomoonshine Lake monster and the Anaconda is that the latter has been caught. Hollywood even made the snake a star. Perhaps Maine’s “Poco” is camera shy. The legend of the Saco River Curse and the amphibious monster that lives in that river goes back to 1547. A tribe of Indians lived on Saco Island and they worshipped a river monster. One night in that year, three drunken sailors paddled over to Saco Island, kidnapped a mother and child and tossed them off Saco Falls, believing that they’d survive the fall. They didn’t. The husband just happened to be the tribe shaman and he put a curse on the water, asking the river monster to kill three white men each year. The curse apparently worked. The waterfall was replaced with a dam and hydro-electric power station in the mid-1900s. The river monster, sometimes called the “White Monkey” for his human-like appearance, but with webbed hands, has been seen several times since 1547. The most recent was in 1970. In the 1820’s Joseph Smith, then 12 years old, saw the river monster. He would later go on to establish the Mormon Church. The origin of most river monsters and sea serpents is unknown, but believed to be of Earthly origins. There are hints that the “White Monkey” may be an exception, with extraterrestrial alien ties. The amphibious river creature has never been caught or captured on film. In 1779 Edward Preble was an ensign aboard the ship Protector as it sailed the waters of Penobscot Bay. He spotted a large serpent-like creature that was floating motionless close to the ship. The captain ordered him to row over on a smaller boat and find out what it was. As Preble approached the animal raised its head roughly ten feet above the waterline, took one look at the boat and started to swim away. Preble shot at the animal and it swam faster and disappeared. In 1780, a similar sighting by a Captain George Little was reported in Broad Bay. The captain estimated the creature was about 45 feet long, also with a head carried well above the waterline, appearing to look around. Since then sightings of “Cassie” have been reported in Portland Bay, off Woods Island and through the 1930s and 1940s off of Eastport. The last reported sighting was in June of 1958, by Ole Mikkelsen near Portland Bay. Mikkelsen had the most elaborate description, citing an animal over 100 feet long with a large head, long neck and a tail like a mackerel. Cassie showed an interest in the fishing nets laid out by Mikkelsen’s boat and his fishing partner’s craft, as well as the foghorn each time it sounded. The animal eventually slipped beneath the surface. Sightings of Cassie have decreased since then. Some think the creature has left for deeper and quieter waters, no longer wanting to deal with the increasing ship traffic along Maine’s coast. It is a plausible theory, since whales and other marine mammals tend to stay farther offshore than in the recent past. As of yet, there is no physical evidence that Cassie exists. In 1819 a skeleton of a similar creature washed up on a beach on Mount Desert Island. It measured 100 feet and stretched from the waterline into the beginnings of a forest grove. The bones were reportedly taken to Boston for examination. Cryptozoologists, scientists that study sea serpents and other unproven life-forms, have yet to find those bones. It seems they have disappeared.